We have visited an area in the south west of the United States called the ‘Colorado Plateau‘ a number of times now. The plateau covers the states of New Mexico, Colorado, Arizona and southern Utah. It is characterised by high desert, deep canyons, steep rock cliffs, forests and vivid colours. For us the attraction is in the vast wild countryside that provides endless adventures for backpacking, exploring, hiking, scrambling as well as paddling and rock climbing. There are many signs of prehistoric cultures too: Ancestral Puebloan, including the ‘Anasazi,’ Sinagua, Fremont, and Cohonina. And thankfully much of the area is public lands such as National Parks, National Monuments and Wilderness Areas (although under some threat from the current Trump administration). Listed below are our outdoor adventures- many with links to blog posts. We returned to southern Utah and the Grand Canyon in Arizona in October 2018 for more backpacking in this wonderful area. Back again to the canyons and high desert of the US south west in October 2017! We flew from Scotland to Las Vegas and rented a car with 3 and a half weeks to get out and backpack further into some new areas. Back to the desert and canyons of southern Utah and northern Arizona in September/ October 2016. Two years ago we hiked and kayaked our own version of the Hayduke Trail. Having enjoyed it so much we returned this year with a rental car to hike to some other canyons and interesting places. Whilst we wouldn’t get the full immersion of a multi month hike such as the Hayduke, we were aiming to target some of the most spectacular places in the region with some trips ranging from 1 to 5 days. This post covers covers two day trips to famous National Parks in southern Utah; Bryce Canyon and Zion. In Bryce we simply followed a few of the popular trails on a great crisp clear day with big rolling clouds. In Zion we were looking for something to do on our last day of the holiday that avoiding the crowds. We succeeded as we didn’t see anyone else all day! Also we had a splendid day of slickrock, bushwacking, scrambling and a trail to the Deer Trap Mountain with great views down to Zion Valley. The aim for our final week was to visit new territory to us on the northern side of the Colorado River in Grand Canyon National Park. We chose to try a loop hike, starting at the Indian Hollow trailhead and dropping down to Thunder River, before heading to the relatively popular Deer Creek and then to the Colorado River. From there we would hike along the river downstream off trail on rough bouldery terrain for about 7.5 miles to Kanab Canyon. We would then exit the Colorado and hike a long way up Kanab Creek then Jump Up Canyon, Sowats Canyon to reach the Jump Up-Nail trailhead. All that would be left then would be some jeep tracks and cross country over the wooded plateau back to Indian Hollow trailhead. Saturday 13th October 2018 Starting from the town of Kanab, we drove towards the north rim of Grand Canyon National Park, firstly on tarmac, then a long good quality dirt road due south. There were lots of hunters camped along the way in cold and frosty sites in the high altitude and shaded ponderosa pine forest. The last 5 miles of off road driving turned a bit rougher with a few deep puddles, but with some nice autumnal aspen in the roadside forest. We were delighted to see a couple of Kaibab squirrels with their distinctive long bushy white tails and pointy ears. Indian Hollow trailhead was still in the trees, but in a brighter open spot beside some wooden corral fencing. Leaving the car at midday with 6 days food, we looked forward to potentially the longest hike of our holiday, backed up by a reasonably positive weather forecast after the previous rainy couple of weeks. A short stroll on a trail took us to the edge of the forest and the lip of the north rim of the Grand Canyon- always an impressive sight! We followed the clear trail down the first cliff band to the ‘Esplanade’ – a wide fairly flat terrace between cliffs- and this made for easy walking as we headed east to join with the more popular Bill Hall trail. Some cool slick rock slabs with good looking water in potholes provided an excuse for a stop to admire the scenery. Once on the Bill Hall trail we saw our first other hikers of the day but most were setting up camp and we continued on to the top of the next cliff band known as the Red Wall where we collected water from another pothole for our own dry camp tonight. Here we had our first view of the muddy brown Colorado River, still a long way below us and we descended steeply down a rubbly trail through the Red Wall into Surprise Valley. The temperatures had been cool today and we felt that we had lucked out as this area can get oppressively hot even in the autumn! Surprise Valley itself hangs above the Colorado River and is the result of huge historic landslips. Once in the valley we headed east to set up camp just before the divide above Thunder Springs. There were rain showers passing through but we stayed dry throughout the night with our tent nestled in behind some boulders. Sunday 14th October 2018 A great day! We take a short side trip down to the unusual feature that is Thunder Springs – a huge waterfall emerging from underground and through the middle of a cliff surrounding by lush greenery supported by this perennial water source. The views beyond were cool too with Tapeats Canyon snaking its way down to merge with the Colorado. Picking up the camping gear we headed back on trail across the dry arid ground of Surprise Valley to cross the divide on its north side above Deer Creek, followed by another steep descent down to the creek. The low light and clear air resulted in beautifully coloured walls either side of us. There were gushing springs feeding into Deer Creek and we had a stop there under some cottonwoods. The hike down Deer Creek to the Colorado River was an absolute delight- initially through lush greenery and cactus then on rocky terraces through a steep striated and sculpted canyon. We found some hand print pictographs on the rock walls. We exited the canyon all too soon but had the grand view of the Colorado River a few hundred feet below us now. Down at the Colorado we wondered around the stunning waterfall as Deer Creek plunges over the final cliff to the Colorado and met some other people as this is a popular spot for river rafting groups to take a break. Thankfully the temperature was only a little warmer here as we now had an exposed bouldery, trackless walk alongside the Colorado River. We left the boating groups and started picking our way through boulders right down at river level, before using rock terraces to traverse under a ‘Tapeats’ cliff band to reach a small spit of sand. Resting here under a tamarisk we enjoyed a little breeze sweeping down the river and we debated the way ahead as we knew we needed to climb up steeply at some point to avoid being cliffed out. We noticed a few cairns just above the sand spit and climbed steeply up a scoop in the rock to reach a wide sloping terrace above which made for easier headway- and birds eye views down to the river. We crossed a little gorge and Martina took water by scrambling down to a small pothole perched above a steep drop- one of our best water sources ever! Shortly after that we came across Siesta Spring which also had good water- and it was running. Onwards, we pass a cool jumbly conglomerate wall then drop back to the river at Cranberry Canyon. We decide to stop at the confluence of Fishtail Canyon and the Colorado River. A short stroll up Fishtail revealed some cool canyon walls and more clear water in large potholes. Also near our camp we saw some ‘scraping rocks’ which must have been used in the past to sharpen tools. Monday 15th October 2018 The going along the river was slow, mostly through boulders with very occasional trail and some bushwhacking near the river. We make steady time though and take about 3.5 hours to cover the 4.5 miles to reach Kanab Canyon. The scenery was stunning with the shadows shifting as the sun rose through the morning and we enjoyed this cross country hike under the towering cliffs of the canyon. A few rafts pass us on the way and they helpfully ask us if we need anything or would like a lift down to Kanab Canyon! Brian was tempted but Martina resolutely wanted to keep hiking! The water was flowing strongly out of Kanab and is a brown muddy colour- a sign that the recent storms are still having an effect. I (Brian) was concerned that we may not make it up the canyon as I had read that there are tricky deep pools to negotiate even at normal water levels. We knew we could expect the extra obstacles of high water levels, soft sand and mud and some storm debris of logs and branches. A challenge can be good for us though(!) and we set off anyway and at a fast pace up the cobbly river banks with frequent muddy river crossings. Kanab is a beautiful canyon with unbelievably high limestone walls and constant twisting and turning. We passed under a sublime huge striated alcove with water dripping over the edge in a curtain from above. After about 2.5 hours we made it to the junction with ‘Whispering Falls’ canyon and its strong clear flow of water. This was to be our turn around point if things were too difficult, but we had no thoughts to that now and kept wading up canyon heading for a possible camp near a landmark tower at ‘Scotty’s Hollow’. The going got tougher with a series of large dank muddy pools and car sized boulders to scrabble over and round. Each presented a test for us to work out how to get round them- wade deep pools, burrow under them through gaps or scramble up the canyon side? Surprisingly, we meet a large group of student age hikers coming down canyon- if they have made it thus far then we could relax in the knowledge that we should be able to make it up river. Eventually we arrived at Scotty’s Hollow, a large side canyon from the west with clear running water and at a tight ‘u bend’ in the canyon overlooked by the lofty ‘Scotty’s Tower’. We found a good camp above the river (in case it floods again) but under a cave with loose looking rock unfortunately which made us a wee bit nervous lying underneath protected only by tent fabric. That was a 10 hour day of wet, silt, boulders, pebbles, scrapes and cuts but we both are feeling good if a bit tired. Interestingly for future planning, our pace up Kanab in these conditions was about the same as that boulder hopping along the Colorado River. Tuesday 16th October 2018 Survived the night with no rock fall! We headed up river, still wading the muddy stream and scrambling over huge boulders. Reaching another landmark that is Showerbath Spring, we admired it’s cool hanging ferns streaming with clear water. The going eased a bit from there for 2.5 hours before we hit the junction with ‘Jump Up’ canyon- our exit from Kanab Canyon and a chance for dry feet as it was bone dry! Resting here we watched some ubiquitous but always fascinating ravens soar alongside the canyon walls. Jump Up was narrower and, with smaller canyon walls, provided quite a contrast. The limestone canyon provided lots of ammonite fossils in the pebbles as well as colourful red agates. These limestone canyons have quite a different feel to the sandstone canyons further east, such as the Escalante canyons, which have smoother sweeping walls of the Navajo and Wingate sandstones. Here the limestone is more broken, but equally colourful and full of variety as well as fossils. As we climbed upcanyon it soon opened out and we split into another side canyon called Sowats- this had clear running water and was greener with cottonwoods now appearing. The hiking was now mellower and we stopped to take water for overnight at the gushing ‘Mountain Sheep Spring’ and looked at some pictographs on a nearby wall. A cairned trail provided an easy exit out on the south side of the canyon and back onto the Esplanade terraces. We hunted around a bit for a good campsite away from the trail and on the sandstone slickrock before claiming a viewful spot perched on a rock ledge above a small overhanging rock. Wednesday 17th October 2018 Great to see the return of the sun in the morning after a cloudy chilly day yesterday. We set out south on a clear path along the Esplanade to reach a clump of cottonwood trees marking our exit climb out of the Grand Canyon. It was cold as we climbed up the trail in the shade to the Jump Up Nail trailhead and we grabbed the chance to take a rest when the sun first hit us. Lots of fossils beside the path and expansive views back across the Esplanade to the other side of Kanab Canyon. At the trailhead we hit a dirt road for a few miles back on the rolling plateau and pinyon -juniper vegetation. To get back to the car we mostly cross countried southwards from here and luckily for us the going turned out to be easy and rather pleasant through open woodland crossing a few dry washes. We got hit by a couple of hail showers though which forced us to keep up a good pace to stay warm! Back at the car, we didn’t hang around as snow started falling and we were keen to get through the initial jeep tracks before the snow started lying. It was a sprint but we made it back to the town of Kanab and the end of a fantastic mini-adventure! Wednesday 10th October 2018 We camped inthe town of Tropic, and had more rain and then frezzing temperatures overnight. Looking at our options, we again decided on a short hike of 3 days to hedge our bets with the weather, thinking about the flood status of the rivers. Driving east to our familiar town of Escalante the weather did seem to brighten and warm up a little. Our destination was Scorpion Gulch, a tributary of the main Escalante river and in an area we hadn’t visited before. It involves a 23 mile drive down the dirt track of ‘Hole in Rock’ road, which was mostly dry but with some quite muddy, sticky sections where the road dipped low. We turned off on ‘Early Weed’ dirt road for maybe 5 miles to stop short of a trailhead before a rougher section. This road was in much poorer condition and we were glad of our SUV with higher clearance and wide tyres! The road dropped into a few washes which had been eroded in recent rains. For many of these we got out the car and dug ramps with dirt and stones to ease the drop off for the car. This worked fine but we were both mighty glad to leave the car, gather the gear and start hiking! Our route was across a wide open plateau called Scorpion bench following the excellent directions in Steve Allen’s Loop Hikes in Escalante guide book. The guide is getting old now (published in 1997) but it still is a fantastic resource. The air was clear after the rains, and the panoramic views to the snowy Henry Mountains and back west to the escarpment of ‘Fifty Mile Mountain’ were grand. Our navigation points included a curious little arch sat on top of a broad ridge in the middle of nowhere. From there we wound our way over slabs and through sandy patches for a couple of hours before arriving at the head of Scorpion Gulch. This canyon has steep walled cliffs of the Navajo rock layer but there is a break formed by a huge sand dune that allowed easy access down to the canyon floor. We headed down the dry sandy canyon marked by some cool alcoves and clambered over a 2nd sand dune that fills the Gulch from wall to wall. We were surprised to see another group here- they had come in by llama (!) from a more southerly trailhead (Red Well) and were exploring from a camp above Scorpion Gulch. Soon after, we arrived at green cottonwood trees and the canyon changed character as we followed a faint sandy trail high up on the south bank (RDC). Further down we were able to hike along the wash on cool slickrock with pools and even some running water. The vegetation really thickens in the lower part of Scorpion and we donned some more clothes to scrape past some unavoidable patches of our old friend poison ivy. The canyon blocked up at one point with a waterfall into a deep looking pool and we chose to scramble up the south bank again (RDC) and scrabble over and under some loose blocky rocks before being able to slither back into the canyon floor. Finally we exited from the deep brush out to the bigger canyon and river of the Escalante River and we found a lovely little camp spot on the highest sand banks underneath the huge sandstone cliffs. The plan tomorrow is to wade down the Escalante River for an hour or so then to take a scenic route back on rocky ledges, high above the floor of Scorpion Gulch on the ‘Scorpion Horse trail’. Thursday 11th October 2018 An eventful night- it started raining hard at about 11pm and continued all through the night! We stayed in the tent in the morning listening to the Escalante River roar louder and louder as the water volume swole up in the rain and the river spilled over its main banks onto a first sandbank thankfully beneath the level of our tent. We made a few forries out in the morning to look around and waterfalls had sprung up, pouring down the cliffs on all sides above us. It was a scary sight as we were now pretty much locked in by the river and the cliffs! Thankfully the rain started to subside around about midday and the waterfalls shrunk in size pretty quickly. We looked at the Escalante though, and it had enlarged into a mighty brown torrent and there was no way we were heading downstream. We instead decided to have a go at retreating back out of Scorpion Gulch as the water flow had been pretty small yesterday and we only had to cross the river in a few places. Packing the wet gear up quickly, we headed up for a good soaking through the now dripping deep brush of the lower section of Scorpion. But it wasn’t too hard and by the time we reached the slickrock and pools the sun had popped out, so we immediately spread all our damp gear out the rocks for a thorough drying session. Upper Scorpion Gulch was grand again and we stopped to watch a raven and its shadow gliding alongside the canyon walls. We hiked back up the sand dune exit and onto the plateau now dotted with pools in the slickrock. Time was getting on and we stopped to camp beside the low arch for another excellent scenic campsite view. Friday 12th October 2018 Breakfast cooking and sitting on top of the arch was wonderful and we had an uneventful but fun short hike back to the car. What we feared now though was the drive back on the dirt road after the 12 hours of rain. It turned out to be heavy work stopping and digging ramps at about 7 or 8 washes to create a driving route through. However we made it and were glad to reach Escalante town for a shower to wipe all the mud off ourselves and our clothes. Another fine little adventure trip even though it wasn’t what we had planned! Monday 8th October 2018 We sat out a day of rain in the town of Panguitch (rhymes with sandwich! and is an Indian word meaning ‘Big Fish’) with it’s cool brick built Mormon centre. The weather looked better further south around Zion National Park the next day so we headed down there intending to do a long version of the classic hike on Angels Landing. However there were massive crowds in the park- queues of cars, no parking available and then queues for the shuttle bus to take people to trailheads. We got ourselves out of there quickly as this was not our idea of fun! Finding a café, we pulled our maps out and came up with another 2 day hike outside the park to an area we had briefly visited last year – Canaan Wilderness. I turned out to be an excellent choice! Parking near the hamlet of Rockville just south of the Virgin river, our aim was to walk south for 2 days over Canaan mountain and end up at the towns of Hilldale/Colorado City. This is a long way by road from our start point so the downside of the cunning plan was the need for a long hitch hike on two roads back round the mountain range to the car. Anyway, that was for later and we set off on a dirt road then a good trail through cactus, pinyon and juniper uphill to an area called Eagle Crags. There were clear, red rock views over the tree canopy north to Zion Valley and the steep enclosing mountains. After Eagle Crags a fainter trail continued south marked by cairns but was slow going in and out of numerous gullies. The trail soon headed steeply up through a band of cliffs to pop out on a broad ridge. The markers disappeared here and we headed cross country south with a little scrambling down into and across a sage brush valley and then up slickrock on the other side before entering the ‘Sawmill Spring’ drainage with its beautiful slickrock dotted with ponderosa pines. Time was getting on and we were able to find a good campsite on the flat rocky slabs perched above the wash. With some large potholes full with water below us and grand views it was another great camping spot. Tuesday 9th October 2018 After a frosty, still night we headed up ‘Sawmill Spring’ drainage again to scrabble up through thicker brush at the top past Sawmill Spring itself. We missed the spring but soon found a track heading along the slabby watershed. We were in Canaan Mountain Wilderness and vehicles are banned here, so it was disappointing to see fresh ATV tracks. Nevertheless it was grand country and a point of interest was an old desiccated wooden ‘Windlass’ used to winch logs down the 1000 foot sheer rock face to the plains of the Arizona Strip below. Peering out south here we could see the land rise to the North Rim of Grand Canyon many miles to the south. The trail continued on a mix of sand and slickrock until we arrived at the ‘White Domes’- we had camped here last year but it was no hardship to visit this stunning series of rocky domes again, this time with the strong midday sun and deep blue sky adding to the scene. We crossed more stunning slickrock before descending down into green, lush Squirrel Canyon and its running water. Last year at around the same time, the foliage was bright and autumnal but strangely this year everything was still green. Squirrel exits into the lower valley at Short Creek and we continued downstream next to the running water. All too soon we were on tarmac heading south for the town of Hilldale on the Arizona Border. We had an amzing set of three hitch hikes in very quick succession (thanks everyone!) back to Rockville and learnt a fair bit about the history and changes in the Mormon township of Hilldale/Colorado City! We had time to visit the cemetary and Ghost town of Grafton – with some fame in that the bicycle scene in Butch Cassiday and the Sundance Kid was shot here. Friday 5th October 2018 With a wet forecast for the next few days we again set off on a shortish trip carrying food for 3-4 days. Starting at noon at the Lower Muley Twist trailhead in the southern section of Capital Reef National Park, the weather was surprisingly bright with big puffy clouds. 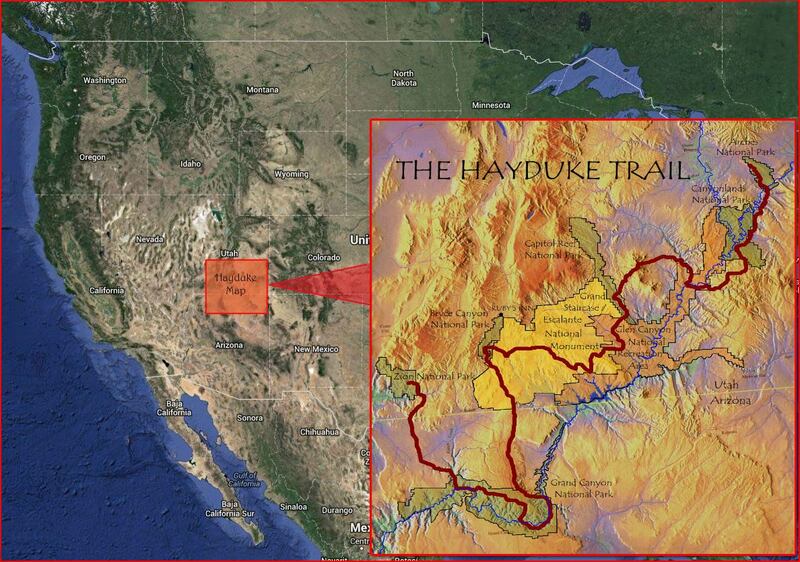 We had been here before in 2014 on our longer Hayduke hike and this time intended to repeat a hike of Lower Muley Twist canyon but then head off to explore different areas and to do a loop back to the car. Muley Twist was superb last time and didn’t let us down this second time. Its mostly a wide twisting canyon for 12 miles or so with easy walking down the dry wash. The huge Navajo sandstone sidewalls with black water streaks are stunning but it’s the massive alcoves that are the standout. These must be some of the biggest caves or alcoves eroded out by the canyon wash we have ever seen. They are quite hard to capture on camera but it’s cool just to stand underneath looking up at the roofs. Saw quite a few bats today in the daylight which was unusual too. The final alcove down canyon is known as Cowboy Alcove and contains some cool graffiti and artefacts from the early 1900’s. Muley Twist is normally dry but there were a few pools of water in the sandstone potholes from recent rain- the wet weather has had some benefits! We explored a side canyon for a while heading west at the bottom. Jamal Green has used this one as a means of accessing the high plateau across to Silver Falls and Choprock Canyons. We took a look for about half and hour and enjoyed the wild, rough, bouldery scenery but chose to head back down Muley Twist and find a campsite near the certain water source at ‘Muley Tanks’ where we had camped in 2014. We exited out of Muley Twist with a narrow final eastward slant into the wide Halls Creek. Camp was found just as it got dark at a serene stretch of slickrock leading to a side canyon to the west. On the way we came across an old midden of flint rock lying under a small cave. Excellent end to the day! Saturday 6th October 2018 Dark skies as we awoke and had breakfast looking out across our side canyon and the main Halls Creek. We left the backpacks and headed into our side canyon by wading through a short pool section then into the scenic narrow canyon which ended all too soon. Picking up the backpacks we made our way to the big pools of water at Muley Tanks then headed up the slickrock slabs behind to a place called ‘Hamburger Rocks’. A cool series of red boulders sitting on top of smooth slabs. Easy slabs took us back into the dry wash of Halls Creek again and its wide open views. Halls Creek Overlook Trail was taken east out of the main creek and it climbed quickly amidst varied colourful rock and boulders. Great views back to the rippled folding rock layers. Rain crept in from the south and we were soon getting wet hiking north now on vehicle tracks. With a long wet dirt road hike ahead of us, we caved in when a SUV passed by and we hitched a lift (thank you!) for about 5 miles to another hiking trailhead called ‘The Post’. The Post trail heads west back over the folded rocks and into Muley Twist canyon again. This is another superb little trail although views were a bit limited with mist and rain rolling in. This trail could be used as an alternate to the Hayduke missing out the Burr Trail dirt road zig zags and the top 2 hours of Muley Twist. Maybe 50/50 as to which option would be better. The rain worsened to a torrential downpour and we sped back up Muley Twist with sheets of water pouring down the canyon walls. It was a bit of a relief to reach the car and get out over the dirt road with rain banging off the windscreen. That said though this was another varied and scenic short trip! A splendid short scrambling backpack past some amazing sights in the Escalante catchment. Wednesday 3rd October 2018 With wet weather over the last few days and more forecast, we decided to cut down our ambitious plans for a week long hike in the Escalante catchment and instead go for a 2 or 3 day loop down into the Upper Harris Wash area of Escalante. We parked on the Sheffield Road a few miles off Highway 12 east of Escalante with an eery mist hanging over the canyons. The sun soon broke through though and we started off down into the slickrock of Bighorn Canyon. This is a tremendously colourful place with generally easy hiking broken up by some interesting scrambling down slots and bypasses round the trickier drops. We left the backpacks at the junction with the west fork of Bighorn and explored it’s narrow slot for a while past some surreal swirling rock layers. All too soon we arrived at the junction with the larger more open canyon of Upper Harris Wash. The temperature was still cool and this was an enjoyable hike with wide views out to the canyon walls and puffy clouds studding the deep blue sky. We stopped beside a shady wall for a late lunch before continuing down the dry streambed seeing some people heading for Zebra and Tunnel Canyons. Soon after that Harris narrowed and a trickling stream appeared running down a mellow green avenue of cottonwoods. We noticed lots of woodpeckers along with coyote and turkey footprints in the muddy wash.
Just as the canyon widened a little we scrambled up onto the southern slickrock slopes and set up camp on flat rock overlooking the canyon in a lovely spot. We have been prefering camping on rock out here in Utah where possible as we make very little impact compared with camping on soil or sand. Our freestanding tent and inflatable sleeping mats make it easy too and it opens up the option of more interesting and often viewful sites. Thursday 4th October 2018 Massive pyrotechnics last night as thunderstorms gradually came closer accompanied by torrential rain. So glad we pitched the tent above the canyon floor! In the morning Harris Wash had flooded from a trickle of clear water to a muddy torrent about 15 meters wide. Crossing the river now looked impossible but at least the rain had stopped and the sun was out again. After a pleasant breakfast in the sun we scrambled out of the canyon to the south and followed slabs pitted with fresh pools of water to then descend back to Harris at the 2WD trailhead. The river is wider here and levels appeared to have dropped allowing us to wade across to the north side fairly easily. Cattle trails gave quick progress along beside the line of cottonwoods but the cows have grazed heavily and the vegetation looked pretty damaged. Soon enough past Red Breaks canyon we picked up a jeep track heading northwards under a lovely clear sky and cumulus clouds. Our target was a geological oddity and wonderful sight given various names such as the Cosmic Navel or Volcano. A cold southerly wind at our backs assisted us up to the volcano sitting near the top of a slickrock hill. Wow! -a huge hole in the rock filled with red sand and a rock island sitting inside. Its not really a volcano but is believed to be an old river meander or abandoned meandor (rincon) raised up through time to the top of the hill. After exploring around the volcano we headed north over a beautiful undulating sea of slickrock before reluctantly descending to Big Spencer Flats and picking up a dirt road. This was a long walk back to the car but the clear air and panoramic views made up for it to round off a superb hike!